I love being a full-blooded Italian, don’t let my light coloring fool you! It’s always meant a great deal to me holding to some of the traditions that we had as kids growing up back East in the Poconos. Being located so far away from all of my relatives is hard so cooking the way my mom did helps make me feel closer to home. Italians love to cook and eat and I’ve learned to make quite a few dishes with the help of mom over the phone. My list of cooking accomplishments include, Pizza both Focaccia and Red, Lasagna, Eggplant Parmesan, Mozzarella and Parmesan cheese, Pasta Fagioli, Fried Zucchini Flowers, many varieties of pasta sauces, Stuffed Artichokes, Stuffed Mushrooms, Calamari, Stromboli, Meatballs, Pizzaiola, Italian Wedding Soup, Minestrone, Pizzelle, Pastarelle, Lemon Sponge Cake. Then there is Scartellate, Sfgliatelle, Ricotta Pie, Calzone with Ricotta, Cannoli’s, Biscotti, and Pizza Fritta. This is a partial list, these being our favorites. I pulled up on YouTube, to see first hand, how they make Cavatelli and then we decided to try it that night for supper. It was fun to make but it took way too long, even with 4 of us doing the work. In the end the kids had to milk cows so mom and I finished up the pasta. Nonna was not that pleased with how they looked before we cooked them, so when everyone loved them, I think she was surprised. Around here, I keep telling her nothing goes to waste. I should note that if you want to know how many cups of flour you need for your particular family size you can figure around 1 cup of flour per person. Basically, you only use water, unbleached flour and salt to make good Cavatelli. We used 9 cups of flour for this meal. After dumping the flour on the kitchen table, dusting it with salt and making a hole in the middle, we slowly added cup after cup of water until we had formed a nice elastic dough. We worked it for a few minutes then covered the dough letting it rest for 15 minutes. 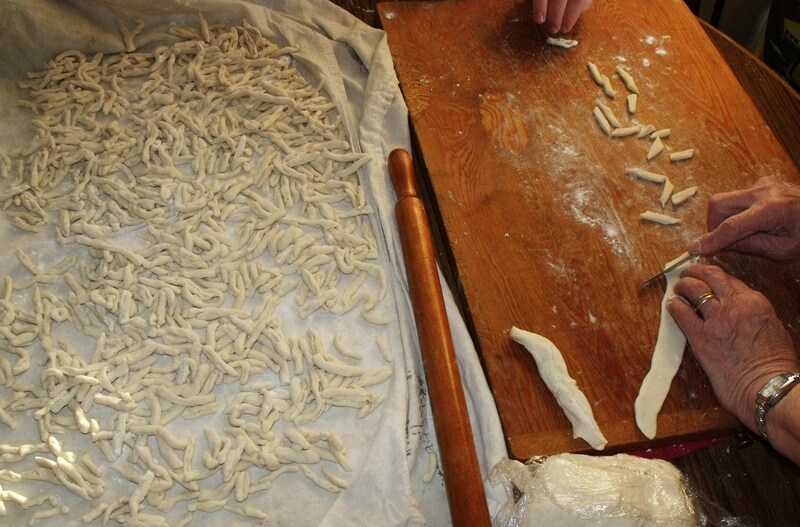 Next the small balls of the dough were rolled into long “snake” shapes and flattened with a rolling-pin. 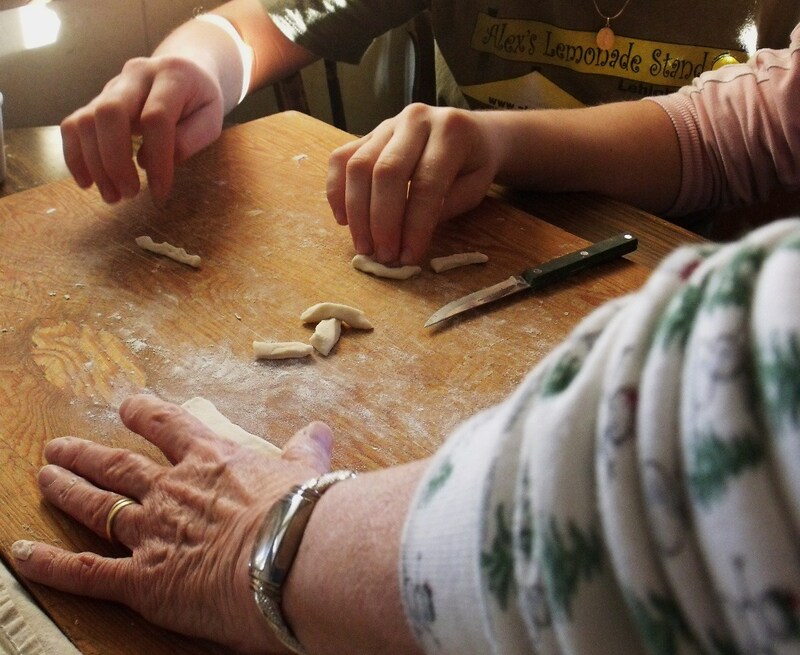 Then, we cut small pieces and used two fingers to shape them by rolling them with two fingers towards us then quickly flicking them the other way. The process is not easy to explain, but if your are interested in making this check on Youtube by plugging in Cavatelli. Seeing it done makes it much easier. I made up a quick sauce to use on the Cavatelli. Browning the olive oil and garlic very lightly, steaming in my pressure cooker the broccoli until just barely cooked, taking the green juice from the pot and adding it to the cooled oil mix, approximately 2 cups. Then I added my frozen sweet Italian basil, salt, pepper and more garlic in the form of powder. This was boiled and then turned off. Next, in went the broccoli. That’s it. This sauce tastes delicious on any kind of pasta by the way so give it a try. The amounts are not that important, only the way the fragrance of the sauce is in the kitchen. I also use this exactly the same way with Asparagus. 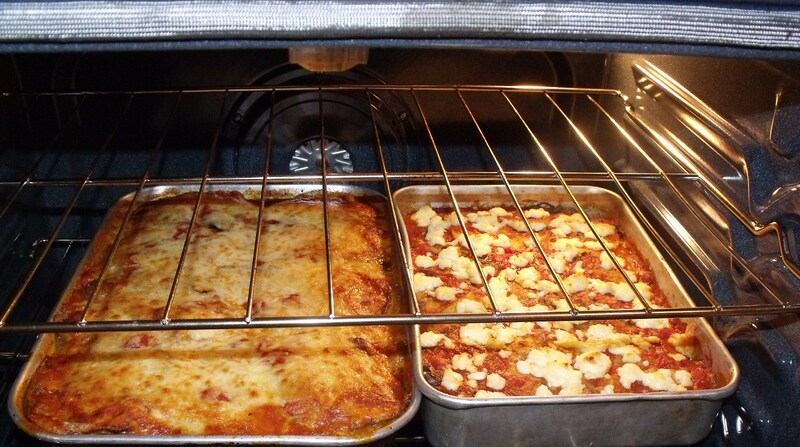 I’m not sure what I was thinking, but the very same evening I made up two Eggplant Parmesan pans. I lost a bet with mom though, so sure was I that the family would eat both trays, only I underestimated how “heavy” the Cavatelli was. We barely ate one tray of the parmesan, serving 12 people. The garden produced a bumper crop of eggplant this year so we fried them up and froze them to be made later into this particular dish. That is a very big job but well worth the effort to be eating so well all winter. Below is the photo of the two trays we made. Both are topped with our own Mozzarella Cheese. This entry was posted in FARM KITCHEN and tagged hand made cavatelli. Bookmark the permalink. You are lucky to have lived in Italy!! Start cooking REAL Italian at home then. It is very easy. Love, love , love the way you cook! You go! Thanks LIsa:)) Beth and Fiona too. That sounds wonderful. By any chance have you posted how to make Italian Wedding Soup? I had some at a cafeteria of all places and it was yummy. Homemade should be even better. Serve topped with a dusting of parmesan cheese. If you want more specifics email me and I will give more detail. Thanks! This was my first time eating endive, and it was wonderful, but a little expensive. It would be worth learning to grow my own. I had to adjust things a tiny bit for what was on hand, so it wouldn’t match up to yours. Still, it was sooooooooooooo delicious. It’s a keeper. Thank you for the extra e-info and thank your Mom too. Big bear hugs to you both. Thanks for letting us know; you are very welcome and thanks for the hug too:) I grew endives here in MN. Very easy to do and I would think down there you could easily do it. You can quick blanch and freeze them for later use. Good luck to you. you better send some pasta home with nonna for ME!